This morning was a boring day of park the minxes in front of CBeebies while I attacked the mess that is our kitchen. When I could finally see some work surfaces, I decided that we’d all suffered enough purgatory and would make cheesecake together. Well, what a half-witted idea that was! First Midi Minx ran amok with the rolling pin, smacking her sisters with it. Then Mini insisted on using her little rolling pin, but crushing Maxi’s fingers with it. Maxi is a forgiving little soul, but Mini’s cackles of glee gave her game away… I gave them a biscuit each to distract them from guzzling too much of the ingredients. Ha! Those were just weapons, too. Then they all independently got the screaming ab-dabs because I was insisting on everyone getting a turn at everything. It got so bad that I had to let each have a little turn of the food mixer dial… sheesh! It was a relief for it to be done and to usher the little blighters out. Five minutes later the elder 2 were in again, making cool fish-shaped cards for our neighbours who gave us 2 big bags of freshly-caught mackerel over the weekend. That was lovely enough, but the dear lady had even gutted and cleaned them for us! It’s not a job I mind doing, but it’s messy and takes ages, so I’m deeply appreciative. Maxi made me giggle at her giving Midi a lesson in fish biology. She stood at her little chalkboard and gave fine lecture on fins, tail, scales and gills. She drew a great fish outline, drew a line from the gills and helpfully wrote on it neatly ‘gills’. Midi was quite impressed. Mini almost napped. She lay down in her cot, tucked herself in, ordered me to: “You close door now, Mama. Night-night!” but half an hour later I heard her wailing, “I poooooooo!” down the stairs. When I went up to greet her and the stench, she brightly said: “I wake up now!” Aye right, you never even slept! But she was having none of it, so had to get up. Penguin-bomb… target illuminated… painting… and in 3, 2, 1 release! That was fine till Midi joined in. 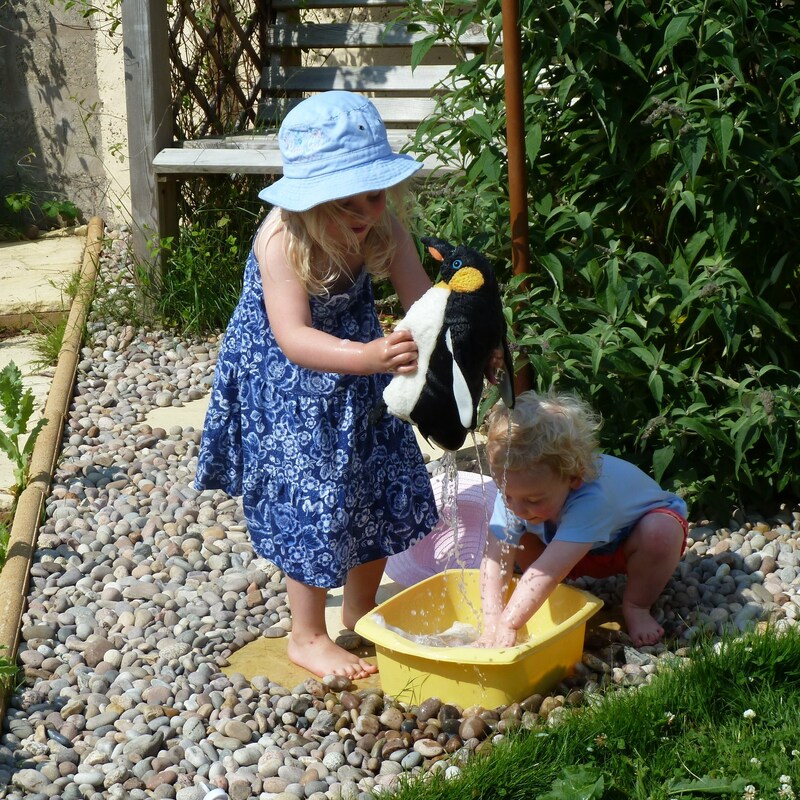 Suddenly Maxi’s penguin was having a bath whilst being throttled and drowned. Within 5 minutes that little basin had defied all laws of physics and proven itself to be a TARDIS: the meagre contents had soaked 3 minxes, 2 cats, me and all the bloomin’ dollies. peaceful quest of trying to save the bumble-bees and make the longest clover chain in history whilst I intercepted a supermarket delivery, fed a permanently hungry cat, negotiated a date for Midi’s grommets operation (end September. They’ll be 3 weeks after the guaranteed NHS waiting time for the op. But hey, we’ve waited 2 years already, and the alternative of keeping 3 girls occupied at a hospital 3 hrs drive away for a whole day isn’t an alternative). I also washed and hung 3 clothes washloads, bowed and scraped before my lord the dishwasher (well it feels like it!) and stopped Midi and Mini from bashing each other on the head *too* many times. I was too tired to make a proper dinner, so cobbled together spaghetti carbonara. 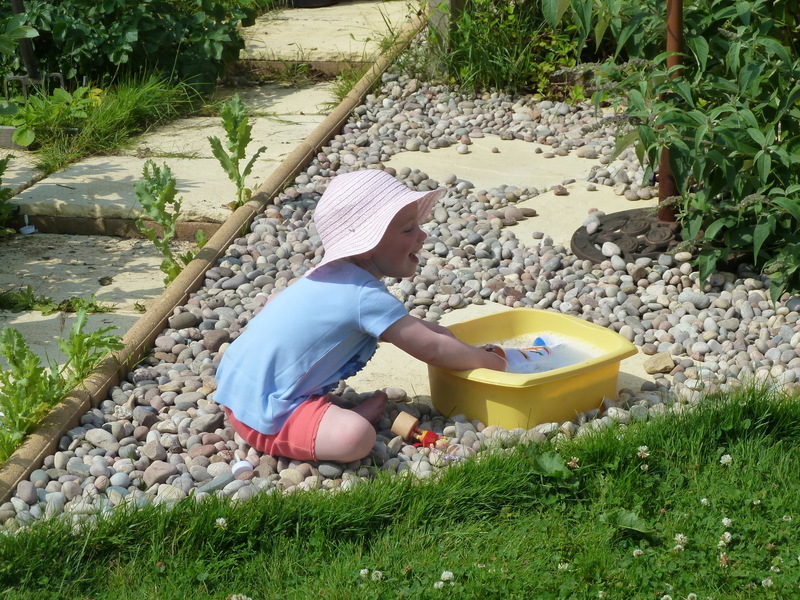 The girls screamed louder than the nesting seagulls, zooming around the garden, playing at trains with hula-hoops and hoiking half the stones of the raised beds across the lawn and back in the real, heavy wheelbarrow (I’ve given up worrying about bashed toes and trodden digits). The minxes demolished dinner, shovelled down the cheesecake, accepted that they needed baths gracefully and were snoring before 9pm. Success! 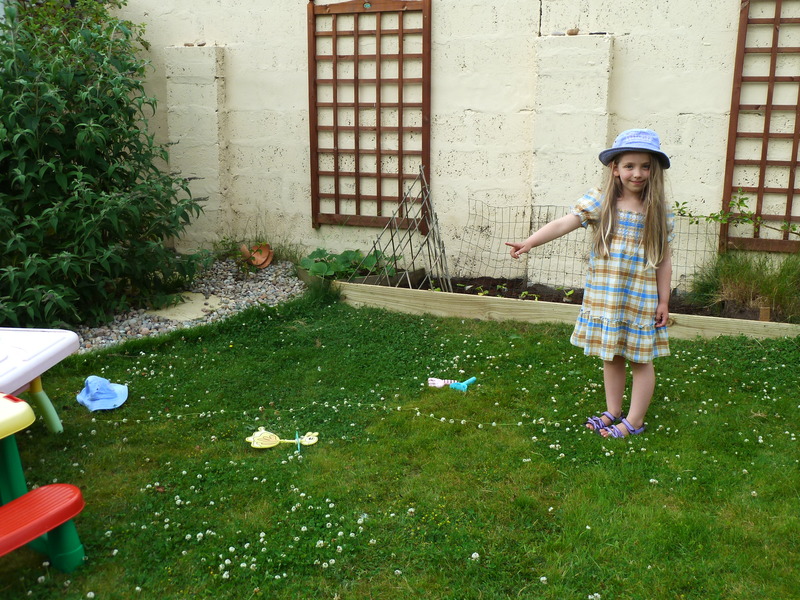 This entry was posted in food, gardening, Out and About, squabbles and tagged bathing dollies, drawing, fish, grommets, naps, school summer holidays by GrumpyOldTrout. Bookmark the permalink. Oh my, my heart goes out to you Jay, and I had almost forgotten…the pressures when your girls are 22 (can’t count maxi as she is self sufficient in Holland) 19 (away in Newcastle in term time) and 16 (my my she is 4 girls put together of trouble but HURRAH GCSEs are over for the last time)…the mini is always the trial 😉 are very different……. we wouldn’t have it any other way, would we?